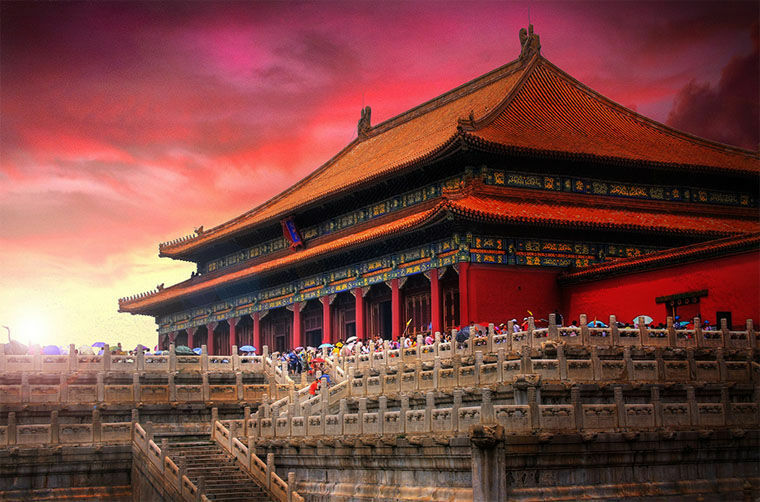 Beijing's top 3 attractions are awaiting to offer you a complete Beijing trip. The Forbidden City that is located in the heart of Beijing used as the imperial palace from the Ming Dynasty to Qing Dynasty for 24 emperors. Having served as the political and ceremonial center of Chinese government for more than 500 years, The Forbidden City is a popular tourist attraction in the city and houses a museum. Since 1987, the Forbidden City is UNESCO’s World Heritage Site and it is a perfect example of Chinese palatial architecture. It is also known as having the largest collection of preserved ancient wooden structures in the world. It stretches 961 meters long from north to south and 753 meters from west to east. 980 buildings of it survived today and the palace is circled by an 8 meters high wall. Once it was forbidden to enter into the site without the permission of the emperor, so the name of the palace was called the Forbidden City. Remember that it was announced that the number of the visitors will be limited and the ticket sales will be stopped after 80000 tickets are sold for a day. So you can visit the official website of The Forbidden City to book your tickets online. Temple of Heaven that is located in the south east of Beijing, is a complex of religious buildings. The temple was visited by the emperors for prayer to heaven annually. Reportedly, Temple of Heaven is so important for China that when the Forbidden City was being built, they paid extra attention not to make it larger than this temple. And it was the center of all religious ceremonies. Temple of Heaven also surprises its visitors with its facts. It is believed that if one enters the building from the north, evil spirits can come in, too. So you need to enter the garden from the south. The main building is completely made of wood without using even a single nail. The buildings located in the site are also built to let the sound waves spread even more easily because emperors used to speak to God by this way. Since 1988, Temple of Heaven has been UNESCO’s World Heritage Site. It covers approximately 260 hectares of area housing many playgrounds and exercise areas both for adults and children. The park of the temple is open between 6:00 and 22:00 pm. Another must visit tourist attraction in Beijing is undoubtedly the Summer Palace. It is believed to be the best preserved imperial site in the world and it is located at a 15 minutes driving distance from the center of the city. It consists of more than 3000 houses and covers 70 thousand square meters of area. Not all the buildings are accessible by the visitors but the other accessible parts of the palace are second to none. The interior design, decoration, stunning corridors, bridges or promenades are more than enchanting. Although it was highly destroyed in the late 1800s and the early 1900s due to the invasions, the Summer Palace was rebuilt in 1924 and was open to the public again. If you get the most out of the palace, you need at least half a day plenty of walking so you’d better plan your day considering this. If you wish to see the island temple, you can take a boat-ride which takes nearly 10 minutes or you can prefer watching a traditional show that is staged at the traditional theater in the palace. A Beijing trip without visiting the Summer Palace will be nothing but a regret.